Summer is always fun and slightly unfocused for us. We're not extremely structured during summer break. We eat dinner late. Go to bed late. Squirt sleeps late. The only thing we set our alarm for is golf clinic. We don't make plans too far in advance likely waiting until the morning of to make plans for the day. And it's wonderful. Until about the first week in August. It's too hot to be outside even to swim so boredom tends to set in. So I am always ready for the first week of school to begin even though it means giving up my laid back structure. For some reason though a bit of melancholy sets in once I've dropped Squirt off for the first day of school. It tends to linger most of the week. A couple of friends and I were discussing this and I'm not alone in this. Perhaps it's just the unusual quiet we now have at home or maybe the realization that our babies are all too quickly growing up on us. Squirt started 5th grade this week. I'm not quite sure when this happened. When I pulled into school to walk him in with all his supplies he panicked asking "What are you doing?!!!!" I told him I had to walk him in. There's no way he could have carried all those supplies. To his embarassment I insisted. Then when I started to leave telling him good-bye he refused to give me a hug. I didn't embarass him by insisting. I left the school calling my best friend asking her if she wanted a biscuit for breakfast. I needed a little comfort food by that point. I haven't cried on his first day of school since Kindergarten, but I was definitely on the verge that morning. Thankfully I have a dear teacher friend who called later that morning saying she really needed some help. I spent the rest of Monday and Tuesday helping her. It was the perfect way to keep my mind focused for those first two days of school. 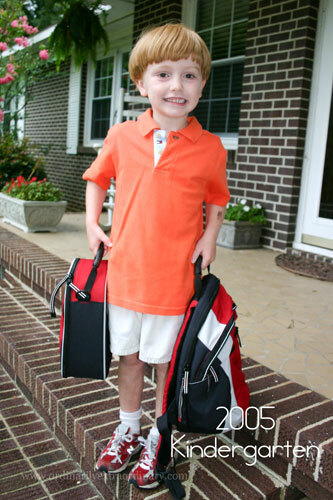 Here's Squirt on his first day of Kindergarten five years ago. I miss that little haircut and those cheeks. 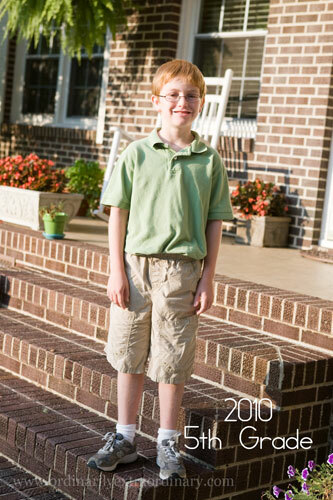 And here he is on the first day of 5th grade. So here we are. He's had a great first week so far and I'm wandering around aimlessly a bit less than I was the first day of school. I'm finding my focus once again in a house full of quiet.